Tucked away in the charming town of San Clemente is a special bakery with a unique charm. 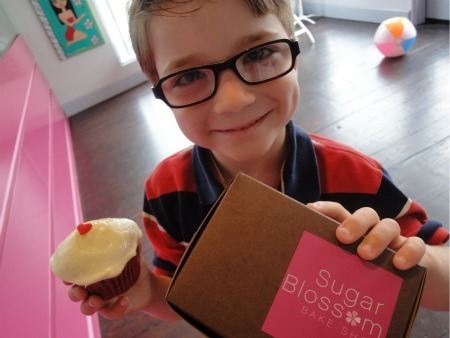 When you first walk into Sugar Blossom Bakery you will be immersed into a pinkalicious world. You can order cupcakes, cookies or specialty coffee. Your children will have a chance to admire all the beautiful artwork within the bakery while enjoying their special treat. 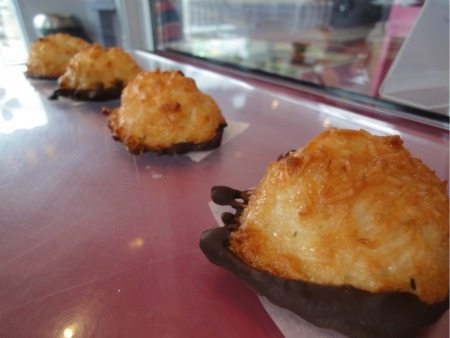 Sugar Blossom Bake Shop was founded by Chef/Owner Lei Shishak. Lei began her culinary career in New York City. While working in finance, she took a weekend job decorating cakes at her neighborhood sweet shop which quickly sparked her desire to learn more about pastry and baking. She enrolled at the Culinary Institute of America in Hyde Park, NY. Graduating at the top of her class with honors, she went on to work in Sun Valley, ID, Los Angeles, CA and most recently Dana Point, CA as the Executive Pastry Chef of Michael Mina’s Stonehill Tavern at the AAA Five-Diamond St. Regis Monarch Beach Resort. 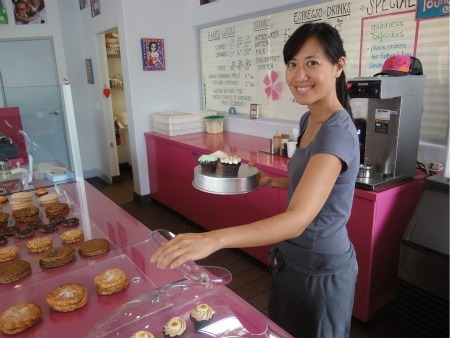 After over three years there, she felt compelled to open up a neighborhood cupcake and cookie shop in her favorite beach town of San Clemente and thus Sugar Blossom was born. 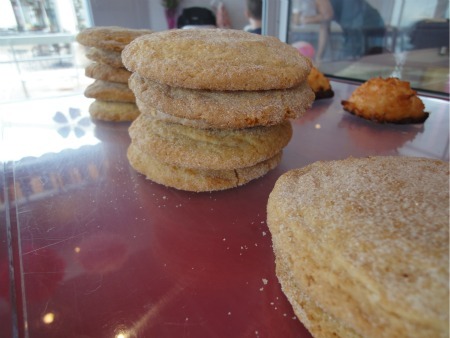 At Sugar Blossom Bakery you can order gluten free cookies and macaroons. The bakery always has gluten free cookies within their store, however you can also special order gluten free cupcakes. If you want to special order gluten free cupcakes you need to allow 48 hours notice. Gluten free cupcakes are $3.00 each, or $16 for a 1/2 dozen and $30 for a dozen. All the cupcakes are made within an exclusive gluten free kitchen. The gluten free cupcakes contain white rice flour, tapioca flour, potato starch, sweet rice flour and either almond or coconut flour. There is a 3-hour free parking lot across from Sugar Blossom. Enter on Ola Vista or Ave Cabrillo. 2-hour free street parking is also available. They are open Tuesday-Friday from 11-7pm, Saturday-Sunday 10:30-7pm, closed on Monday.